User review of the month, April – Neat Momentum 3i | What Hi-Fi? 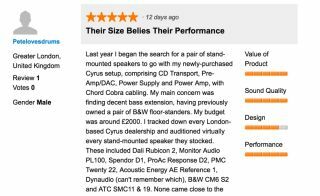 This month's winning user review finds a reader happy with his speaker choice after a thorough audition process. We're all for trying before you buy, and What Hi-Fi? reader 'Petelovesdrums' certainly made sure he'd weighed-up all his options before he splashed the cash on a pair of Neat Momentum 3i speakers. As a result, he was pretty happy with his purchase. And we've picked his user review as our favourite from last month, so he now has a pair of SoundMagic E10 headphones in the post. Showing the importance of system-matching, he went to the trouble of auditioning a host of new speakers with his existing kit - a good pair of speakers won't necessarily sound their best with every amp. There's no better way to make sure you'll be happy with the resulting system and most dealers will be more than happy to help you do it. As a result, this user review offers plenty of detail on comparative speakers should you be in the market for something similar, before touching on what he likes so much about the Neats. "Neat's Isobaric design (two drivers mounted one behind the other, inside the enclosure) produces great bass reinforcement without sacrificing mid or high end reproduction," reads the review. And he's clearly smitten with his purchase: "For me, there's nothing better of comparable size, and certainly not at this price - unless the updated version SX3i is even better." You can read the full Neat Momentum 3i user review here. Congratulations to Petelovesdrums and enjoy your new headphones. You can review any product you own that's in our system. Just search for the product and then click the user reviews tab on the product's review page. Need some inspiration? Look back on previous user review of the month winners, which have focused on a Sony system, B&W speakers and a 4K OLED TV.